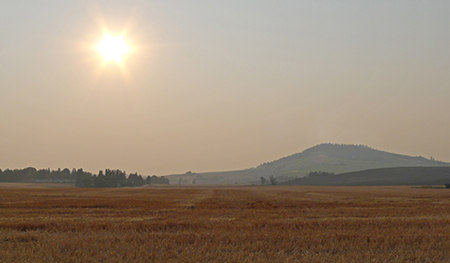 PULLMAN, Wash. – WSU’s College of Veterinary Medicine recommends that animal owners be aware that wildfire smoke advisories, issued by county and municipal health districts for people, apply to animals, too. Now through the early fall, wildfire season conditions are varying from unhealthy to hazardous levels for people, particularly with as winds shifts and air quality changes. Pets and other animals should be protected from potential dangers of smoke inhalation as well. Currently, advisories show winds shifting and possibly bringing more smoke from a number of regional fires. Dryland harvest is also underway, and those conditions naturally put more dust in the air. Smoke tends to worsen at night as it settles into valleys and low-lying areas and disperses somewhat during daylight hours. The college’s board-certified internal medicine and cardiac specialists also recommend paying more attention to pets that have been diagnosed with lung or heart disease. Just like humans with such conditions, smoke and dust in the air represents an increased hazard for those patients. For animals that cannot be sheltered indoors such as livestock or horses, these signs can signal increasing respiratory distress in those species, too. Large animals however seem to deal with wildfire smoke better than pets. Interested parties in the Inland Northwest can check air quality at the Spokane Clean Air site. Other states and regions should check with their regional air quality and health organizations.